Wow! The very first gardening library book which speaks so forcefully and personally that I want my very own copy. And there's more - I want to send copies of The Garden at Larnach Castle to all my gardening friends! Lots of books tell the story of restoring and developing a garden. 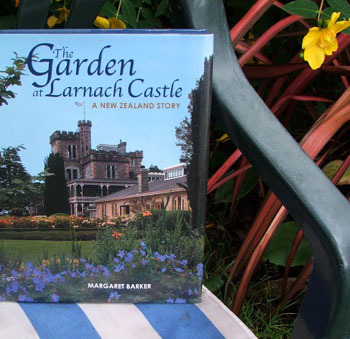 Margaret Barker's book tells the story of her life spent doing just this at Larnach Castle, on Dunedin's peninsula hills. New Zealand is such a young country gardenwise - there are barely even any Victorian gardens to restore. Larnach Castle was purchased by the author in the nineteen sixties - the gardens were run down and overgrown, as was the castle itself. As a New Zealander I'm extremely enthusiastic about this book. Larnach Castle's private-public gardens have evolved over time, with the vision and commitment of its strong-minded owner. Many New Zealand gardeners can identify with Margaret Barker's development as a gardener - she's worked through the 'dripping-with-roses' phase and come securely out the other side, a wiser woman. She grew rhododendrons very safely on her hillside for years. But finally, returning from an inspiring tour to Yunnan in China and seeing the real thing, she pulled most of them out. The gardening practices at Larnach Castle are seriously sensible, and New Zealand natives are lovingly integrated into the landscapes. I like the sense of plant protocol. For example, preferring not to let the shrubs 'develop into lumps' - what a good way of putting it! I was lucky to have a wonderful visit Larnach Castle's gardens earlier this year. Having done no research what-so-ever, I still managed to find some of the gardener's treasures - the rock garden (amazing), the view across the bay (more amazing) and the South Seas Garden (interesting). New Zealanders can't seem to resist a tiny bit of a global name-dropping. Margaret Barker pops in Sissinghurst and the Chelsea Flower Show, Inverewe in Scotland and the great Irish gardener Helen Dillon. HD's advice to 'build and plant bigger' results in the widest, silliest set of steps - garden-tour ladies could easily descend twelve abreast, in step like a chorus line, with room for a few indelicate wobbles. Next time my garden looks scruffy, or trees, ponds and paths need maintenance, or flower borders need grooming - remind me to hire all or some of the following: A Head Gardener with a BSc in Botany, two apprentices, an arborist, a man to do lawns and paths, a rigorous dead-header and flower-border groomer, and a plumber - for the irrigation... And then remind me to try opening to the public, host weddings and tours, and still stay smiling and full of fresh new ideas! The Garden at Larnach Castle - A New Zealand Garden is published by David Bateman Ltd, and the ISBN number is 13:978-1-86953-639-8. It's warmly written by Margaret Barker (her quotes are in italics) with photographs by Stephen Jaquerty and others. 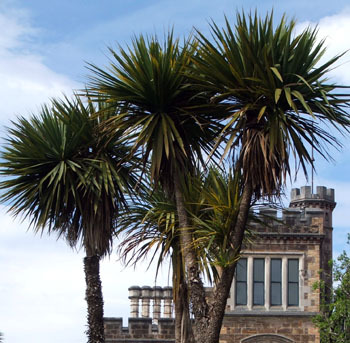 You can see more of the garden by clicking the Larnach Castle Garden link.